LAS VEGAS – Clay Elliott is on a hunting expedition in the Nevada desert. 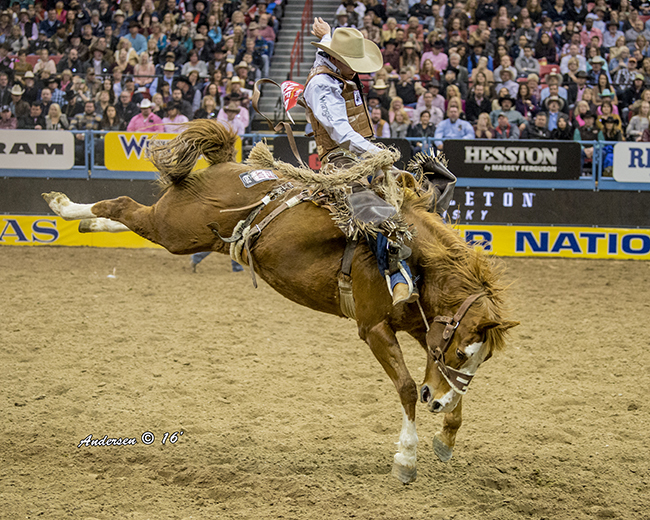 Elliott, a saddle bronc rider from Nanton, Alberta, came to the Wrangler National Finals Rodeo in hopes of bagging his portion of the $8.8 million purse that’s up for grabs over 10 December nights. After a few shots that missed their target, he’s got his sights zeroed in on the big prize. He utilizes a solid spur stroke from the front of the horse’s shoulders to the back of his saddle while doing so in rhythm with the animal’s bucking motion. The better the spur ride, the better the score. The better the score, the better the opportunity he has to finish among the leaders and earn Las Vegas cash. He did that during the sixth round of the NFR with an 82.5-point ride on Big Rafter Rodeo’s Pearl to finish in a tie for sixth place. That was worth $2,115 and pushed his Sin City earnings to $25,442. “I saw Jacobs (Crawley) get on that horse in the first round,” said Elliott, who was born in Vernon, British Columbia, and received his education at Oklahoma Panhandle State University. “It just looked like a really nice horse that could get away from a guy a little and maybe covered a little bit of ground. Judges base their scores on the 100-point scale, with half going to both the animal and the rider. Each judge awards up to 25 points for horse and cowboy, so Elliott wants to be as near perfect in his spurring motion as possible. Now he’s placed in back-to-back go-rounds and pushed his season earnings to $105,491. “Confidence is a big thing, but it’s more just feeling comfortable for me,” he said. “It took me a little longer than I had anticipated to feel comfortable, but I do now. The hunt continues over the final four rounds of ProRodeo’s grand finale, and his target is the biggest game in Las Vegas.